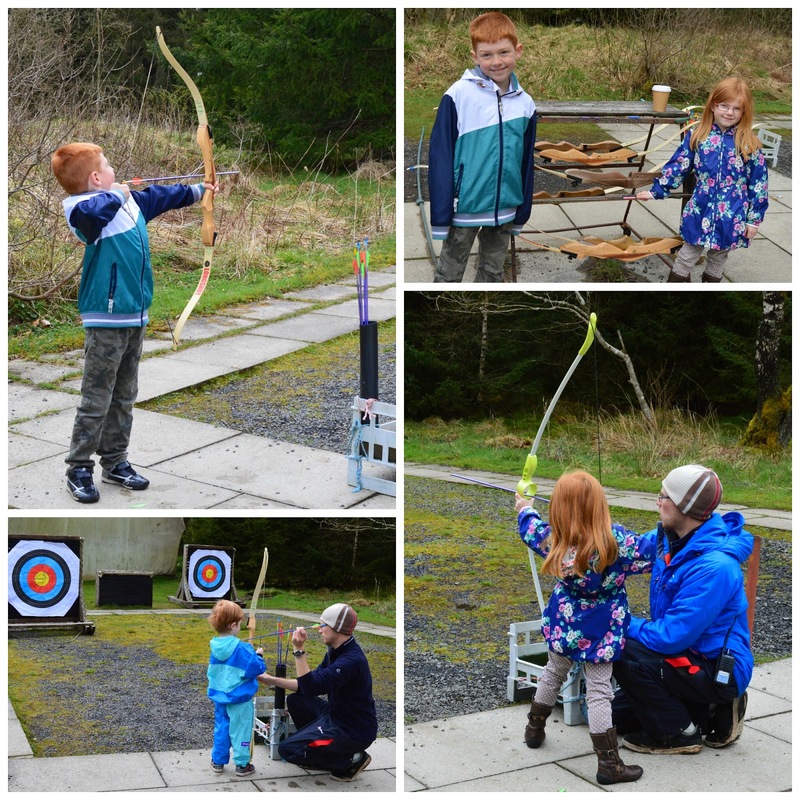 Last week, we spent a wonderful adventure-filled weekend at The Calvert Trust in Kielder. We stayed in a fabulously spacious and well-equipped lodge (more on that tomorrow) situated on the river side and enjoyed a variety of on-site activities during our stay. Kielder really is a special place - despite it only being about a 1.5 hour drive from our home in South East Northumberland you feel as if you are in another world. There is absolutely no mobile phone signal, the skies are some of the darkest you will ever see and there is only one tiny village shop. Despite it's remoteness, Kielder is a real hub for outdoor activities and really is the place to visit if you would like to disconnect from the world, spend time relaxing and enjoying the gorgeous surroundings and have fun/challenge yourself with new outdoor pursuits. The Calvert Trust state on their website that they want you to really love life, delight in new experiences and gain reward from being challenged and I think it is fair to say they achieve this. The registered charity has over 35 years experience in delivering outdoor activity holidays for people with disabilities. They are fully inclusive and open to everyone to enjoy - disability or no disability, everyone is made to feel welcome. Their Kielder site opened in 1984 and welcomes over 5000 visitors a year who enjoy family activity holidays, themed weeks, team building sessions, drop in taster days, school visits and more. Our family of 5 stayed on a 2 night activity break which are priced from £167 for two people sharing (click here to download a full price list). We arrived close to 10pm on Friday evening with three very sleepy children. You can check in until 11pm which is fantastic for families if you don't want to keep your children off school on the day of arrival. We were greeted by a very friendly member of staff who advised us to book our activities as soon as possible. I asked their advice and was pleased to hear that our 4, 6 and 8 year old were welcome to try everything (including zip wires and abseiling). We decided to book in for archery and clay pigeon shooting the following afternoon which is something I have always wanted to try. Activities are charged at £10 per person per hour (including your own instructor) with discounts available for group bookings and half day/full day bookings. People who are not staying on site can also try various activities during regular activity drop in days. Our first activity on Saturday was archery - both Steve and myself have memories of trying this through school as a child and were keen to have another go. We were met by our instructor Jason in the main reception who carefully went through the safety rules with us all before we started. We found archery to be fantastic for building determination and confidence. During our first attempts I completely missed the target! but persistance and some hints, tips and tuition paid off and by the end of our hour-long session I was shooting like an expert (well that's what it felt like) and managed to hit the bullseye a few times and pop balloons that Jason placed on the boards for us to use as targets. Steve enjoyed this session so much he has decided to join a local archery club so thank you to the Calvert Trust for introducing us to a new hobby! There are various sized bows for you to choose from and your instructor will find the right one for you. Harry (aged 8) could pretty much shoot by himself after a couple of attempts and didn't need much assistance. Heidi and Jack (aged 6 and 4) did find this activity more of a struggle though. This is when The Calvert Trust really comes into their own - they truly are fully inclusive. Jason had a few tricks up his sleeve from moving the target closer to letting the little ones use a specially adapted bow and even a clamp (which has been designed for wheelchair users) to hold the weight of the bow to help them. Jason was wonderful with our children and they really got a lot from the session. They may not have hit the target much but they still thoroughly enjoyed themselves and loved having a go. What I liked about this activity was it is something the whole family could enjoy together. Despite different levels of ability we all had a fantastic time, improved our skills and spent some real quality time together as a family. Our next activity to try was laser clay shooting. I have ALWAYS wanted to try this so was very excited to give it a go. Jason explained that we would be using real guns so we should expect them to be fairly heavy. They had been adapted though so we wouldn't be shooting bullets but rather a laser that worked to hit special strips on your targets. This put my mind at ease as they were perfectly safe for our children to use - no need to be worried about them accidentally shooting themselves! It is important to show a gun respect though, even if it isn't going to be firing bullets and we were all given a safety briefing before we started. I didn't take as many photographs during this activity as we were all pretty much shooting at the same time. The gun was heavier than expected and certainly caused my arms to ache! There were a combination of still targets (which our children aimed for) and moving targets which were the challenge for myself and Steve. I was very frustrated during my first 10 times as myself and Steve didn't hit a thing! I moaned to Jason and asked if it was actually possible - he assured me it was and encouraged me to keep going. Then the magic happened! I heard the electronic sound effect and saw the green light flash on my gun which meant I had hit something! Woohoo! I was ecstatic and thrilled and even more so when it happened again. This is my smug face - there was a little bit of competition between myself and Steve and I came out on top! The guns were too heavy for our children to hold but Jason helped them by either resting them on the wooden ledge (for Harry) or fixing them to rope pulleys (for Heidi and Jack) which supported the weight for them. Heidi shared in my jubilation and was over the moon to hit her target no less than 29 times and beat both of her brothers. I was proud of all three of my children who really embraced this activity and tried their hardest to hit their targets. After our fun-filled afternoon we headed back to the main reception where we helped ourselves to complimentary juice and the children played outdoor chess whilst we tweeted our achievements using reception's free wifi (although we were trying to get away from it all - I do need my social media fix when I can get it!). The on-site hydrotherapy pool is free to use for guests who are staying at The Calvert Trust or only £2.50 per person per hour if you aren't. Sessions are available to pre-book every hour at reception and although the don't guarantee exclusive use, this is pretty much always the case and it was a lovely treat having a whole pool to ourselves. The changing room is large and more than adequate for our family's needs. There is also an infra-red sauna to try too (moderate extra charge). There is no lifeguard so lone-swimming is not allowed. The pool was the perfect size for us to feel safe enough to allow our eldest two to practice their swimming without their armbands (under close supervision of course). Our hour long session was over in a jiffy, if we had been a little more organised we would have definitely booked an hour in the pool every day. Harry actually cried when we had to get out which bearing in mind he usually isn't a fan of swimming and can usually be found glued to his laptop speaks volumes. There are only a handful of lodges at The Calvert Trust and they are very well spaced out meaning you aren't on top of each other. There is plenty of grass for children to play on (we loved spotting lots of rabbits during our stay), nature trails to take part in, outdoor chess to play and a lovely park to enjoy too. We took a few of our nature books with us and spent some time identifying birds, trees and flowers - of which there were many! We thoroughly enjoyed trying some of the activities on offer at The Calvert Trust. It is a type of holiday we hadn't really considered before but turned out to be the perfect mix of fun, adventure and tranquility and was a pretty good way to spend the weekend together as a family. You can find out more about booking a holiday at The Calvert Trust here and their drop in activity days throughout the year here. Look out for tomorrows post which is going to feature our wonderful Calvert Trust lodge and a post next month featuring an afternoon in Kielder village which is a short drive from The Calvert Trust. This sounds action packed! Can't wait to read the second installment! What a fantastic read! 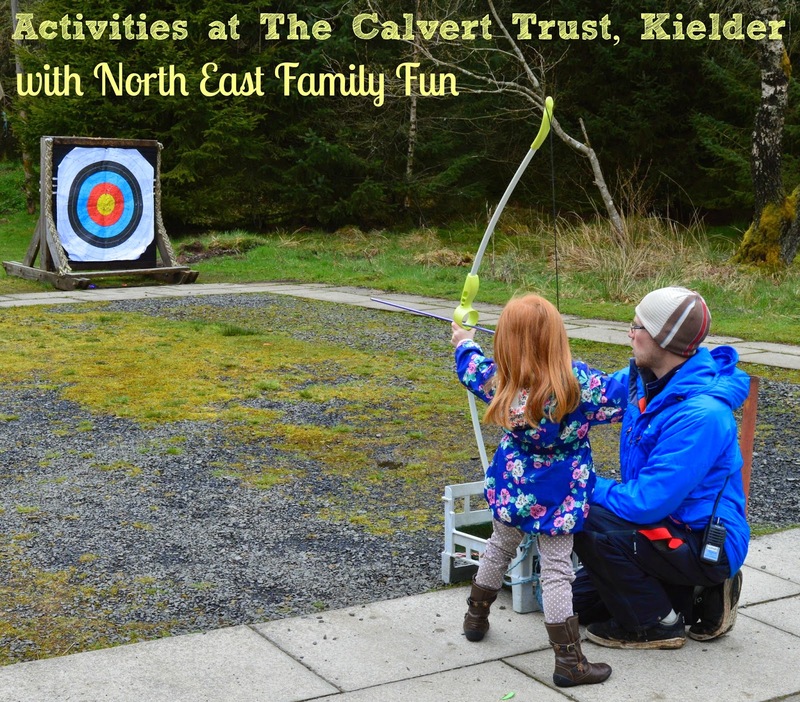 We're definitely heading to Kielder on our staycation and Simon is a huge archery geek so it's good to hear they do activity days for people not staying over. I've just checked the website and they have dates in July so we can get ourselves booked in! This looks amazing, we stayed in different lodges at kkeilder and loved the peace and quiet and great outdoors, I'd love to try the Calvert trust now I just need to convince mr Sun lounger ! What wonderful activities that look perfect for all the family to join in with. Mine have had a go at archery with scouts and loved it, looks like yours did too. What a lovely family break for you all with well spaced out accomodation, thank you for sharing with me on country Kids.